Note: In an effort to make this incredible nutrient, that fixes just about everything, more accessible, my provider lowered their price to me, which allowed me to pass the savings on to you. Unfortunately, the USPS raised their rates, but even so, the cost is still much lower than it was. 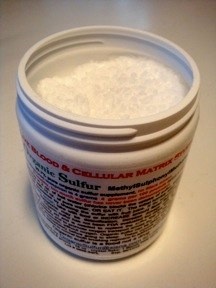 Organic Sulfur crystals are shipped in two one pound containers. This should be about a 3-Month Supply. Please select the drop down choice for shipping destination (USA, Canada/Mexico, or International), and Quantity. Methylsulfonymethane is marketed lucratively as MSM. The process starts with crystals, which are then turned into powder with anti-caking agents, like silicon dioxide, added to it. This presents a problem for the people that buy it because when the crystals are turned into powder much of its effectiveness is lost. When the anti-caking agents are added to it, the remaining benefits are nullified. To derive the maximum benefits from MSM, it must be in the form of organic crystals and lignin (wood) based or prepared with Food Grade DMSO. MSM is made from lignin based DMSO (Dimethyl Sulfoxide), and DMSO is made by processing the waste product of paper making ("pulp and paper industry") it is NEVER made by simply processing trees or any other form of plant life (no matter what you might read in some less informed Internet sources), for the sole purpose of extracting DMSO. It COULD be, just as seawater could be used for the sole purpose of extracting gold, but this is totally impractical. DMSO is extracted from the waste product of papermaking and it is the PAPER MAKING that allows the whole process to be practical. As paper is made, the paper is made of the fibers of wood. But, as trees grow, the fibers of wood are stuck together, in the living tree, by a substance called "lignin." Lignin is like glue that holds the fibers together. The wood could not be made into paper if all the fibers are still stuck together. So, papermaking must include some process by which the lignin is removed, allowing the wood fibers to be managed into flat paper, etc. Lignin is removed with something called "pulping chemicals." These chemicals are sodium sulfite (the majority), sodium sulfide and sodium carbonate). When these chemicals are soaked in a vat with wood chips, the lignin dissolves and the wood fibers can then be removed from the mass. Generally, about 50% of the stuff in the vat would be the wood fibers, ready for making into paper, and 50% would be the residue, the waste product, of the original "pulping chemicals" and the lignin that has now been dissolved. That first liquid is called DMS (CH3 - S - CH3), but it quickly and easily further refined into DMSO. Food Grade DMSO is the main ingredient from which MSM is made by a controlled oxidation process using hydrogen peroxide (H2O2) and water. There are no other chemicals used, and the H2O2 is turned into water. It is very important to realize that if you purchase Organic Sulfur Crystals, then the MSM you receive has been distilled. NO CHEMICALS ARE LEFT BEHIND. It is the purest possible form of the chemical MSM. Organic sulfur is found in all living organisms. It is also contained in raw plant and animal foods. Organic sulfur is not found in any foods, which have been either stored during shipping, refrigeration, or cooked. Organic sulfur bonds with moisture and is therefore carried away when dehydration occurs - this is why stored, refrigerated or cooked foods no longer contain organic sulfur. Also, with the introduction of the petro-chemical fertilizers in the 1930's, the benefits of sulfur were severely diminished and why you must stay hydrated and drink lots of water daily. Also, with the introduction of the petro-chemical fertilizers, which were created to replace manure as fertilizer and to create a cash “crop” for the petro-chemical industry, the oil based fertilizers virtually destroyed the sulfur in the soil. Add to this the obscene over-processing of our food supply, which served only to increase shelf life and profits and which made our food supply completely devoid of sulfur, it's no wonder that we are a nation of overweight, undernourished, disease-ridden sickos hooked on pharmaceutical drugs. When, in 1985, Finland became alarmed over the increasing obscene disease rate of its population, they banned all use of chemical fertilizers fearing the levels of cadmium, yet totally unaware of the sulfur connection. Since doing so, they have become the leading supplier of organically grown foods in Europe. They have also seen their disease rates drop to one tenth of their 1985 levels. Interestingly enough, in 1985, the U.S. was at the same disease level as Finland. So. Why did we not follow suit and ban the chemical fertilizers and put a lid on the highly processed foods? Well, as the theme song to Donald Trump's TV show began, “Money, Money, Money”! Do you really think that we would cease our use of profitable chemicals for our soil and our food, which involves commercial agribusiness, medicine, insurance, and genetic and designer foods? We can, however, regenerate our internal sulfur cycle with Organic Sulfur Crystals, provided that this product has not suffered the same indignities of “science” that our food supply has and continues to suffer. Like sulfur, the cell membrane is another blind spot in medicine. Despite proof that the cellular membranes need sulfur to be utilized and formatted correctly so any cell can function as the basic unit of life, medicine still depends upon synthetic chemicals to treat a symptom. In the body, ORGANIC SULFUR is used to repair cells, which have been damaged, as well as to promote the growth of healthy new cells by allowing the cells to transport oxygen more effectively. ORGANIC SULFUR also makes cell walls more permeable, thus able to allow more nutrients in and to allow waste materials to pass out of the cells. Studies have shown that chlorine and fluorine are detrimental to such oxygen transport, yet these elements have been added to the U.S. mainland and our military bases in Hawaii’s water supply to make our teeth “healthier” and our water more “pure”, or free from bacterial infestation. Fortunately, other than the military bases, Hawaii’s water supply is fluoride-free and I was instrumental in accomplishing that despite an avalanche of industry and Hawaii Dept. of Health executive blatant lies. These elements are poisonous at higher concentrations and they block the uptake of both oxygen and sulfur. Hook up a charcoal filter to your faucet and it removes the chlorine before you drink it. The small amount of chlorine in the water, however, has not been found to adversely affect the benefits of the sulfur. 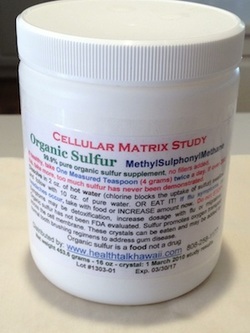 Every day the body uses up to 750mg of ORGANIC SULFUR naturally. ORGANIC SULFUR is natural and is actually found in the water we drink, as well as fresh, unstored and uncooked foods. It is found in fruits, vegetables, meat and dairy products. Unless you mostly consume organic raw foods, you are likely not receiving enough ORGANIC SULFUR to realize its tremendous health benefits. Unfortunately, the shelf-life deterioration for sulfur is rapid in cruciferous vegetables, garlic and onions with as much as a 95% loss of sulfur lost after one week of harvest. Adding insult to injury is the fact that cooked or processed foods have no utilizable sulfur. And sadly, most MSM and other sulfur supplements fail to restore cellular levels of sulfur and omega 3s. The reason for this is that anything synthetic that sulfur comes in contact with renders it useless. What are the benefits of ORGANIC SULFUR? OS has a cleansing or “detoxifying” effect on the cells within the body. It allows the body to remove toxins that have accumulated in all types of cells, including fat cells. Should you feel like you are getting the flu or other symptoms where you feel like you are getting sick, understand that you are not getting sick. It is the detoxifying process and it will pass. While this is happening DO NOT STOP TAKING THE CRYSTALS. The suggested usage is 1 teaspoon full twice per day - one in the morning and one in the evening. This can be done in several ways: dissolved in hot water, putting the crystals in your mouth and chewing them, putting a tablespoon in a liter or quart bottle, fill it with water and drink it all day, or add it to orange juice and take it that way. I personally opted for the chewing method and then drinking orange juice. I have never tasted orange juice so sweet. OS is not a drug or prescription medicine. It is actually a nutrient, or a food that the body can consume. OS increases enzyme production within the glands in the body, substantially increasing overall resistance to illness. OS increases flexibility in the tissues within the body, increases blood circulation and aids in lowering high blood pressure. OS reduces muscle inflammation, promotes healing in the muscles and prevents them from becoming sore. To the degree there is soreness, recovery and return to normality is quickened. Athletes, in particular, benefit from this as the intake of additional OS dramatically increases their recovery time. OS eliminates so-called “free radicals” in the body. Allergies to pollens and certain foods can be reduced or eliminated by its use. OS promotes healthy, increased growth of hair and fingernails. OS has been studied for possible anti-cancer effects. Because of the oxygenation of the cells and tissues, which creates an aerobic environment, cancer cells cannot exist. OS studies have shown the reversal of osteoporosis, Alzheimer's disease, and Parkinson's disease. OS aids in healthy skin production and the reduction of “wrinkles”. It is one of the main ingredients in moisturizing creams. OS can benefit all skin types and ages. It has been shown to be highly effective in the treatment of skin conditions like acne, eczema and psoriasis (bear in mind that these conditions arise from a weak immune system, which the OS helps strengthen), as well as problematic skin and helps keep skin healthy and strong to guard against premature aging and skin damage. OS helps the body properly regulate insulin production. Adequate OS in the diet can reduce the need for insulin injections. OS helps in reducing and often eliminating diverticulitis. Parasites living in the colon are unable to remain attached to the colon walls on which OS forms a smooth, resistant coating. Hatching worms, having nothing to grab on to, are flushed out. OS helps alleviate emphysema. It provides the body with material to manufacture new, healthy cells, on lung walls. Case in point – the asthma I had my whole life after being vaccinated as a child disappeared after taking the sulfur for 3 days and has not returned since it went away in 2007. OS, because of its ability to make cell walls more permeable, causes the body to rapidly release alcohol “hangover” toxins, removing them as waste from the body. The process happens far more rapidly than it takes to recover from a hangover, often as quickly as 20 minutes. OS helps alleviate chronic headaches. Increased circulation in the brain cells promotes proper blood circulation within the brain. Less pressure and pain result, reducing tendencies for headaches. OS reduces hypoglycemia in the body because it has made it easier for the body to introduce blood sugar through more permeable cell walls. Less insulin is demanded for the process, resulting in less overuse of the pancreas. Several months of consistent OS usage can reduce or eliminate hypoglycemia entirely. OS helps alleviate PMS. Glandular production in enhanced by OS to have more “normal” levels of production. Acid levels, enzyme levels and hormonal levels are more evenly balanced with OS. Cramps, headaches and nausea from the monthly cycle can be reduced or eliminated through its use. OS helps promote better kidney function more efficiently. Water retention problems due to bad kidney function can be alleviated. OS can help alleviate eye problems. Dissolve 1 teaspoon of sulfur crystals in 4 ounces of water and us as eye drops as frequently as you like. OS will deliver essential omega 3s throughout the body and will also allow the body to produce vitamin B-12. OS has amazingly reversed autism in 40 children that we know about so far. OS eliminates the need for Viagra or Cialis as it reverses Erectile Dysfunction. Important: If you take any medication or supplements, there must be a 30 minute gap between the taking of the crystals and the taking of the meds and/or supplements. The synthetic chemicals and the anti-caking agents will nullify the benefits of the sulfur crystals. Organic Sulfur crystals are shipped in two one-pound containers. The cost in the USA, including postage, is $74.00 for a 3-month supply, coming to less than $30.00 per month. If you would like to order this essential, incredible mineral, please send a check or money order to the letterhead address. Or, go to www.healthtalkhawaii.com and click on Products and Services to access PayPal to pay by credit card. Last but not least, there is a simple test you can do to find out if what you got is good. Dissolve a bit in a little hot water, put it somewhere and let it dehydrate. After it dehydrates the crystals should appear larger and more pronounced kind of like snowflakes. If not, get your money back because it will be useless.